From AR Emoji to Super Slow-mo video to Live Translations to AKG-tuned stereo sound, Samsung’s Galaxy S9 and S9+ feature a raft of innovative technologies designed to transform how users communicate with as well as share and experience the world. 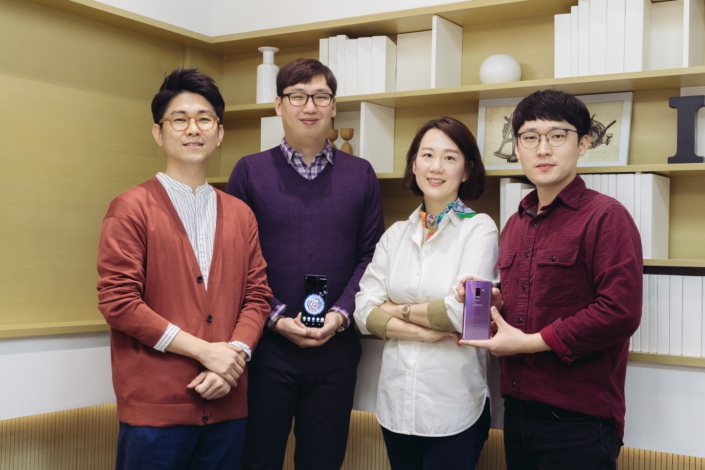 Samsung Newsroom recently sat down with members of Samsung’s Global Product Planning Group – Nayoung Kim, Taihoon Kim, Joohyun Kim and Jonathan Min – who discussed the process of developing a device that’s more powerful, personal and in tune with how we use our smartphones today. (From left) Taihoon Kim, Jonathan Min, Nayoung Kim and Joohyun Kim, of Samsung’s Global Product Planning Group, helped shape the Galaxy S9’s design. Q. 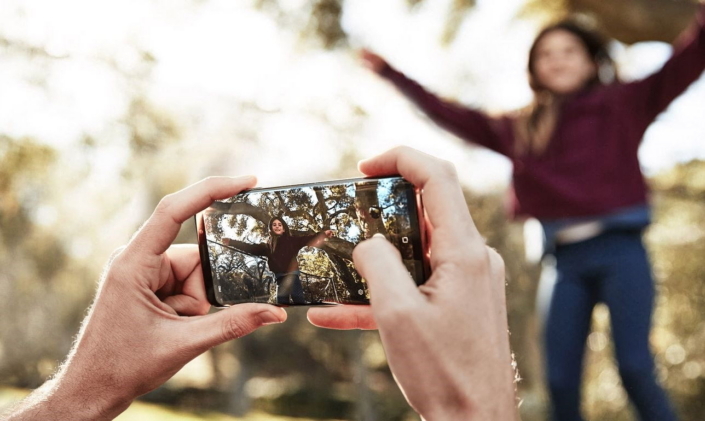 What inspired you to develop the Galaxy S9’s ‘visual communication’ features? Nayoung Kim: Current mobile trends are being dictated by Generation Z, but they are very selective. In our research, we took a close look at how Generation Z are communicating, as well as what kind of apps and functionality they most enjoy. We eventually uncovered an increase in the use of visual forms of communication. For example, members of the social media generation will often use emoticons rather than texts, and they enjoy sharing fun images. So, to cater to this preference, we focused on adding new functionalities to the camera. Q. Could you elaborate on the camera’s development process? Nayoung Kim: When designing the camera, our team focused on three key points. It needed to be capable of recording dynamic video – the type of content that the younger generation loves to consume; it needed to be able to capture low-light photos, which should be a fundamental feature of any camera; and it needed to be easy to use and offer fun new features, like AR Emoji. Taihoon Kim: The product development process for the Galaxy S9 was quite different from that of the previous years, as team members with different expertise strived to discover the visual experiences of everyday life through their own eyes, and how that might translate to camera functionality. These diverse insights enabled us to develop a camera catering to wide needs. Q. How did you refine the Galaxy S9’s user experience? Taihoon Kim: We focused on enhancing the End-to-End scenario of the user experience. For the camera, that involved ensuring easy-to-use Super Slow-mo video functionality, with immediately accessible videos that could be directly uploaded to social media through one intuitive process. You see this sort of seamlessness with AR Emoji as well. 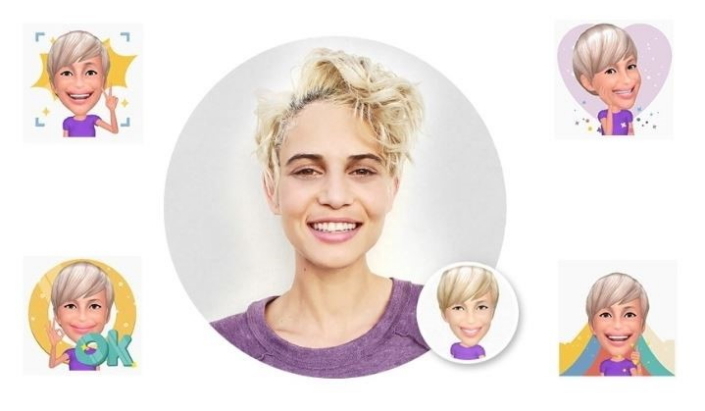 Once you scan your face, you’re instantly given the option to customize your 3D avatar to your liking, and presented with 18 shareable GIFs encompassing a wide range of expressions. Nayoung Kim: We tested the device’s usability extensively, and in various contexts, to ensure the processes were intuitive and organic, and could work across all aspects of daily life. As example, I brought a prototype of the phone with me when I went sledding with my children. The first-hand experience of recording a Super Slow-mo video of my children rocketing down the hill gave birth to the idea of an auto motion-detect function able to capture those sorts of fleeting moments. Q. Which Galaxy S9 feature has received the biggest response from consumers? Jonathan Min: We’ve found that users are very interested in the AR Emoji feature, which we first started working on in 2016. People are used to expressing themselves with emojis and stickers, but this feature allows them to create and express themselves through emojis that resemble their own faces, in a way that’s much more personal. When we started it was new, so everything had to be built from the ground up, and it was difficult to predict consumers’ feedback. It was also our development team’s first time working on something like this, so it took a lot of trial and error to bring the function to life. Nayoung Kim: Our most important goal is to provide users with new experiences by launching the product, enhancing it based on the market’s reactions, and continuing to develop innovative features. AR Emoji will continue to be enhanced in ways that reflect consumers’ needs. Q. Do you have a favorite feature? Jonathan Min: I personally use AR Emoji stickers the most, whenever I message my friends and family. Taihoon Kim: I like the Super Slow-mo function the most. It’s not only great for capturing dynamic actions, but life’s little moments as well, such as the signature facial expression of your loved ones. And the Galaxy S9’s ability to display Super Slow-mo clips on the lock screen creates a touching way to enjoy videos of them. Joohyun Kim: We redefined the design of the Infinity Display to make it even more beautiful and to minimize any ‘distracting’ elements. Subtle adjustments, such as ensuring that the iris scanner is hidden, and that the bezel and display are the same color, helped us deliver a display that makes it easy for viewers to immerse themselves in their favorite content. Q. Going forward, how does Samsung plan to ensure that Galaxy smartphones remain among the most innovative in the market? Taihoon Kim: It will be important to stay a step ahead in innovative features, as well as time them to the market appropriately to grab consumer attention. Consumers can experience visual communications features directly themselves, without an explanation. We plan to continue exploring dynamic visual features, given their unique appeal to the young generation of consumers, as well as integrate new technologies like AR (augmented reality) and AI (artificial intelligence) into our devices. Nayoung Kim: The basic features of smartphones have been refined to the point that consumers are largely satisfied. What matters is not how diverse the offered features are, but whether the features offered to deliver a high level of satisfaction. At this point, we need to think about the next phase for smartphones, which will involve delivering innovations that really resonate with the new generation of users. Joohyun Kim: Smartphones have become essential to daily life. As product planners, it’s our duty to constantly look for ways to improve on ‘basic’ features – those that we use every day – while also identifying brand new functions.